As previously posted on the district Facebook page https://bit.ly/2G29o11 the bids for the High School Addition and Renovation Project were received on March 27, 2019 and they substantially exceeded the cost estimates for the Project. As a result, the Board rejected all bids at its special Board meeting on April 1st. Since then, the Architect and Project Manager have been analyzing the bid results to better understand just why the bids received far exceeded the construction cost estimate. In addition, these professionals have been meeting with the Building & Grounds Committee members and Administration to discuss the results, explain what they believe caused this issue, and develop a strategy so that the Board of Education can move forward with this important high school construction and renovation project. During the Special meeting of the Board on Monday, April 1st, Mr. Romanoli, the project manager from New Roads Construction, shared the bid result range and discussed the average and low bid of the six (6) General Contractors. He also highlighted the different number of sub-contractors by trade that participated in the bid. At this special meeting, Mr. Hopkins, architect, discussed the bid overages. First, the architect has stressed the fact that the scope of the project was not increased during the design development process. In fact, the scope of the project presented to the voters in March of 2018 has not changed. Instead, after reviewing the bids and after discussing the issues with contractors, it is clear that the complexities of the project contributed to these overages. Mr. Hopkins provided information on the trend line change over the past 10 years and informed the Board that construction bids this spring are trending higher. Mr. Hopkins explained how their professional team will move forward and prepare recommendations for the Board to consider. The construction and renovation project is very complicated. The project construction schedule for the project spans over thirty (30) months. As a result, the phasing work presents significant challenges and this has created ambiguities regarding phasing the project and possible liquidated damages should deadlines not be met. In response, the contractors added premiums to the costs. For example, second shift costs to renovate classrooms during the school day were projected and liquidated damages for scheduling delays were projected and this increased the bid estimates. Since the defeated referendum in September of 2015, the market conditions have significantly changed. Specifically, construction costs continue to rise as we have every indication of a saturation of work for the contractors, especially in the General, Mechanical and Electrical trades. There is a lot of work and contractors are extremely busy. The project was bid with specifications calling for a general prime contractor and consideration is now given to presenting the future projects with multi-prime contractors. Immediately bid rear parking lot, underground detention, and utilities as a single prime bid. Immediately bid the removal of existing boiler and installation of a new boiler in the West building. Consideration is being given to include the boiler in the East building as well. We would bid this as a single prime bid. Bid the main connector additions and associated renovations, front parking lot renovations, new library/entry plaza as a multi-prime bid. Bid the fitness center and 300/400 corridor classrooms and associated HVAC as a single prime project. Phase 3: Establish reasonable dollar values and construction estimates for the balance of the renovations, A/C systems, roofing, etc. to be bid as Phase 3 and 4 during the fall of 2019. On the bottom is the most recent rendition of the project and the phasing. The Building and Grounds Committee will meet on Monday evening at 6:15 pm, prior to the April 15, regular meeting. A committee report will be provided to the full Board during the April 15th regular meeting. 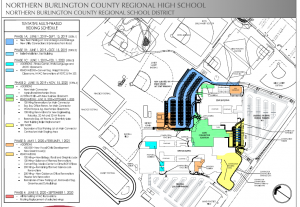 At the April 1, 2019 special meeting of the Northern Burlington County Regional School Board, the Board of Education passed a resolution authorizing the rejection of all bids received for the addition, alterations, and renovations at the Northern Burlington County Regional High School additions and renovations project. These bids for the Project were received on March 27, 2019 and they ranged from approximately $42.9 million to $51.6 million. The Board is permitted to reject all bids if the lowest bid substantially exceeds the cost estimates for the Project. The low bid received substantially exceeded the Architect’s construction cost estimate of $29.7 million for the scope of work. In the next two weeks, the architects and project managers will work with the Board and administration to formulate options, adjust the schedule, and develop possible ‘next steps’ to actively seek the re-solicitation of bids for the High School addition and renovation Project. As this process develops, updates will be provided. On the afternoon on Wednesday, March 27th the Board of Education received the construction bids for the High School Addition and Renovation Project. Unfortunately, the bids were significantly higher than the construction budget. In the next two weeks, the architects and project managers will work with the Board and administration to formulate options, adjust the schedule, and develop possible ‘next steps.’ As this process develops, updates will be provided. As previously stated, Northern Burlington advertised for bids on February 7th with the intention of receiving bids on March 20th. However, due to the comprehensive nature of the project which includes significant renovations and scheduling challenges, the Board of Education has approved extending the date to receive these bids one week, to March 27th. The intent is simply to provide the contractors more time to review the documents and process their bids. So what makes these bid construction documents so complicated? Give the GC the exact quantities, qualities, and configurations required for project construction. The GC also uses these documents to solicit bids or estimates from subcontractors and suppliers he or she will engage. Producing the construction documents takes a collective effort by many design professionals. The preparation includes architects, civil, structural, mechanical and electrical engineers, landscape architects, fire protection specialists, interior designers, security consultants, and other professionals. As the working drawings take shape, the design professionals are able to formulate more detailed budget estimates with the development team. Construction specifications (or the project manual) outline the materials and methods to be used. These specs provide the contractor with everything from manufacturer and model numbers for equipment, to color numbers and paint finishes. The contract documents consist of the drawings and specifications to which the contractor references when he or she bids. Construction document drawings are the large floor plans, elevations, sections, and details that cover each aspect of the building. They provide dimensions, materials, layouts, and in some cases, construction phasing. The working drawings include architectural, structural, mechanical, electrical, plumbing, civil, landscape, interior design, and other specialty areas. Bidding requirements include advertisement information, informational instructions for bidders, bid forms, and specific invitations to general building contractors to bid on the project. Addenda (or additions) include added material to any of these documents issued by the architect during or after the bidding and/or negotiation process. Since the first week in December 2018, weekly project meetings have been held with the architect, project manager, engineers, facilities director, business administrator, and superintendent. Moreover, the Superintendent and the Business Administrator have been meeting regularly with the Board’s Buildings and Grounds Committee to keep them apprised of the progress and developments and the committee, in turn, reports back to the full Board to get direction from the Board as appropriate. With everyone focused on the goal of preparing for the bidding process, many topics have been discussed and many issues resolved. For example, information regarding construction phasing, constructability reviews, and construction schedules has been presented, evaluated, and revised. After the construction meeting this morning, it was determined that both the Architect and Project Manager are in the final stages of bid preparation. Both believe the necessary ‘pre-bid’ work has been completed, design specifications are prepared, and both recommend that the Board prepares to advertise the project for bids early next week. This information was reviewed with the Board’s Buildings and Grounds Committee this evening and approved. This is an exciting development and signals the next big step in the construction process. A review and update of the progress being made on the High School Addition and Renovation Project. During the fall semester, contractors were busy completing the 300/400 hallway connector and while this project was underway, the architects continued to finalize the design specifications for the larger high school addition and renovation project. Over the last three months, we have been narrowing our focus on details of all aspects of the high school addition and renovation project. More specifically, the architects have coordinated all of the necessary utility requirements for the room layouts. They are finalizing and coordinating building wall sections with the elevations. The site work is also being finalized with grading, parking lots, new utility lines and locating building additions precisely on the site plan. Lastly, all capital projects are being developed and are being prepared for bidding. Specifications are also being developed to incorporate schedules, phasing and technical sections for the contractors. It is exciting to note that we are now approaching the bidding phase of the project. The architects are completing the final coordination of their work with their engineers and finalizing all specifications. They have submitted the final Department of Education educational adequacy plans, and now are awaiting the final response from the Office of the State Comptroller. The development of the final phasing plans, which inform the contractor as to which areas will be built in proper sequence, continue to be developed. Site logistics are required so that the contractors understand where they can use portions of the site for preparation and set up areas. Locations of storage trailers, construction manager’s trailers and limits of fencing are critical to the contractors to help best understand where and how the project will proceed until substantial completion. We believe we will be out to bid in January and we hope to be awarding the bids in late February or early March. After the bids are accepted and awarded, the contractors will be procuring contracts for the materials and scheduling their workers and subcontractors to begin the construction of the additions as quickly as possible. Development of the building pad and development of the rear parking lot are critical milestones that will be prioritized to get the project off to a fast start. The architects and project managers continue to meet weekly with school administrators to plan and preparations are being finalized that will safely accommodate the construction while maintaining the daily operations of the high school. We hope to have construction officially start as soon as the weather breaks in early spring 2019.